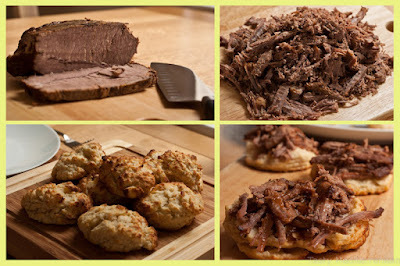 Well, this weekend it was time for my Brisket Biscuit Sliders!! Yep, I know... It sounds amazing :-) And the best thing is that it's super easy to put this together. I cooked my brisket in a slow cooker, but you can also do this in the oven. So, let's roll! - Trim any excess fat from the outside of the meat. Mix the ketchup, coffee and beer together. - In a skillet, heat up the oil and sear the meat for about 30sec on each side. Then place it in the slow cooker, pour the sauce on top, cover and cook on low for 9-10 hours or until the meat is super tender. If you are cooking it in the oven, place the meat and sauce in a casserole dish, cover it and cook it for 3 hours at 180 C degrees. - Preheat your oven to 220 C degrees. - Mix together the flour, salt, baking powder and sugar. Make a well in the center and slowly add the buttermilk. Mix together until a sticky dough forms. - Put the dough on a generously floured surface, flour a rolling pin and roll out into a 6x9 rectangle. Smear the softened butter on top and spread evenly. - Fold the dough in thirds and roll it again into a rectangle. Repeat this process a few times in order to incorporate the butter in the dough. - Cut the dough with a floured round cookie cutter (a glass works too) and place on a parchment lined baking dish. Bake for 10-12 minutes until golden brown. 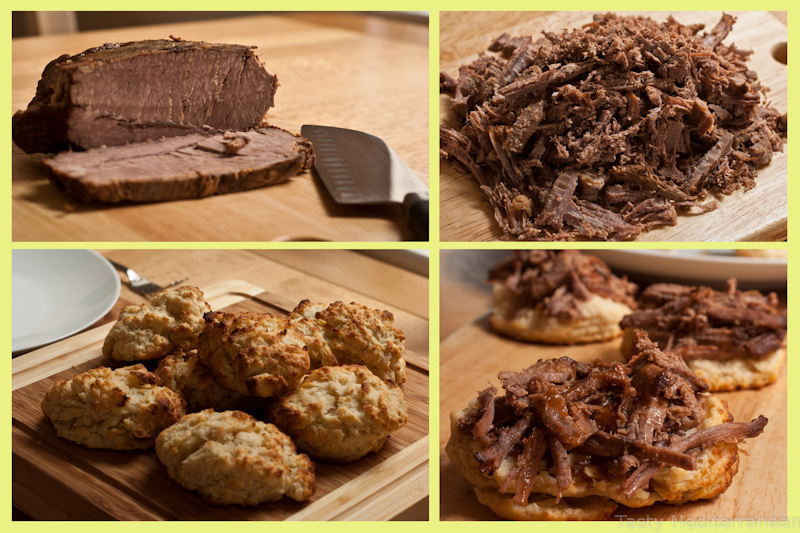 - Slice them in half, place some of the fork-tender brisket on top along with the sauce the meat was cooking in and enjoy! * If you don't have buttermilk, mix 1 cup or regular milk with 1tsp of distilled vinegar or lemon juice.